A client may benefit from the advantages of a machine with integrated robot while he is also able to program the robot and the workpiece loading and unloading attachments according to his individual requirements. Programming of the Stäubli robot is very easy. Just use a PC or an operating desk. Other systems, e.g. 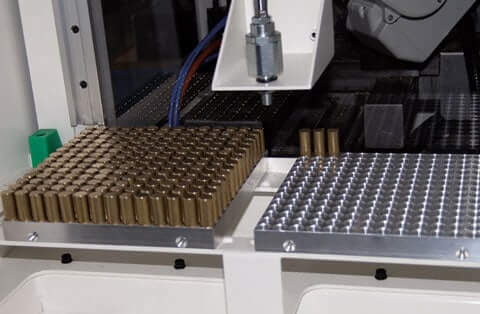 a pallet system, can be used as well to feed the machine with workpieces. For instance, workpiece supply using a conveyor belt equipped with a camera is conceivable. Such a system enables the robot to detect the supplied workpieces and the workpiece orientation. Flexible clamping system: collet or chuck according to application. The robot can be programmed using an operating desk or a PC. Increase the capacity of tooling of the machine which allows to produce complex parts in 1 clamping (turret only on 102 TM-CNC with Fanuc 0i Mate-TD). 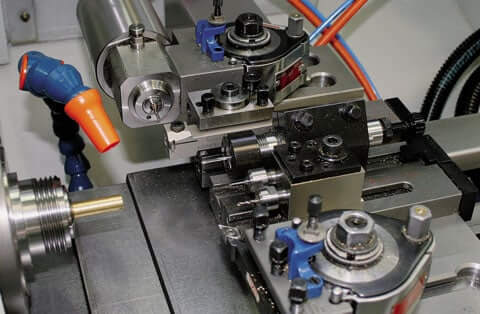 A twin gripper can be installed to shorten the time needed to change the workpiece. 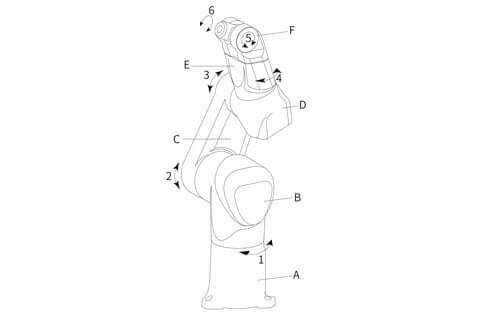 Automatic gripper change is enabled by changing the current machine set-up. Several 102TM-type machines can be combined to build a flexible manufacturing system. Protection of the operators from robot movements by simply locking the 2 machine doors and the access cover between machining area and workpiece loading/unloading area. The turret is 6 fixed positions and contollred by the control of the machine. However, the turret can only be installed on the back side of the carriage. -The 102 TM-CNC robot High Precision Lathe is in conformity with the European Community safety regulations. In view of the constant improvements made to our products, technical data illustrations, dimensions, and weights appearing in this catalogue are subject to change without notice.